Every trip is worth remembering, and every memory should be well-preserved. Transcend Information, Inc., a leading manufacturer of storage and multimedia products, has picked out three must-have gadgets to make your trips safer, easier, or more enjoyable. A prefect journey has to end with a safe return home. Transcend’s DrivePro 520 car video recorder has won Japan’s Good Design Award 2015 for its groundbreaking design. The DP520 features dual cameras to record what happens both outside and inside a vehicle, protecting the on-road and in-car safety. Equip your car video recorder with a reliable memory card to ensure that every critical moment on the road is properly recorded. Transcend’s High Endurance microSDXC/SDHC card is manufactured using to-tier MLC NAND flash chips to ensure stability and durability when used with car video recorders, security cameras, and surveillance systems. 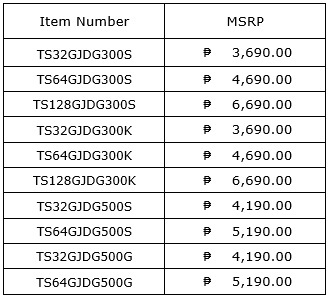 Transcend High Endurance Micro SD cards TS16GUSDHC10V, TS32GUSDHC10V and TS64GUSDXC10V are available in all Cyberzone area in SM Megamall with a MSRP of ₱ 450, ₱ 950, and ₱ 2,150, respectively. As photos and videos accumulate along the way, the users crave for more space on Apple iPhone, iPad, and iPod. Transcend’s JetDrive Go flash drives are specifically designed for Apple iPhone, iPad, and iPod to instantly free up storage space. With the exclusive JetDrive Go App, photos and videos can be captured and saved directly to the flash drive without having to worry about insufficient storage space. In addition, the App automatically organizes files into folders, photos, videos, and documents, simplifying file search and management for users.